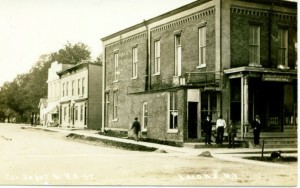 This photo “Lacona’s Brick Business Block” stood opposite the Central Hotel from about 1880 until June of 1966, when because of its weakened condition the village board had it razed and the site paved as a parking lot. (Today Huckleberry Café patrons park here) It was originally built to replace the Tifft Block, which burned on April 14, 1879. A reminder of the days before the advent of the volunteer fire departments, when villages had little protection or defense against fires, is a clipping telling of the burning of the Tifft Block in Lacona on April 14, 1879. The Tifft Block was named for William T. Tifft, a prominent business man in the early days, and stood on the site of the present parking lot on the corner of Park Street and Harwood Drive in Lacona. The Tifft Block was discovered to be in flames, which were under such headway when discovered that all hopes of saving the building were given up and all hands went to work to remove the goods. As soon as the fire was seen from this part of the village the bells were rung and the gong sounded, which started the people from all directions, and soon a large crowd was assembled. As usual, people were much excited and in consequence the property saved was badly damaged. Doors and windows were wrenched from their hangings and hurled into the streets and household goods were hustled out in miscellaneous manner. After considerable talking, a line was formed to the creek and water carried in pails and poured n the adjacent buildings to keep them from taking fire. Wet carpets were placed on the block occupied by G. L. Hydorn & Son and L. R. Tilton and on the Union Center house, but the greatest effort was required to save the residence of E. P. Potter which stood less than ten feet from the burning building. There was no wind fortunately or the flames could not possibly have been confined to the one block. The building burned was occupied by W. T. Tifft’s general merchandise store and his office, the Lacona Post office, Eugene Wheeler’s harness shop, D. E. Wild’s law office and Ed Grants furniture rooms. The greater part of the contents were saved, but the wearing apparel of Ed Robbins and Carlton Tifft. W. T. Tiffts clerks, located in a room over the store was forgotten and consequently consumed. J. M. Jones is also declared a loser because of the fire, since he owned the part of the block in which the Post office was located, while Ed Grant lost about $25 or $30 worth of furniture, neither having insurance. The contents of the post office were saved as were the books and furnishings in D. E. Wilds’ law office.